Bliss is the top selling stamp set from Sale-a-bration. I just love this set, that scroll is gorgeous and best of all it is free! If you've not got your set already then make sure you do so by the end of the month! All you need to do is place an order with me for £45 and you can have it free - either as a clear block mount or wood mount set. 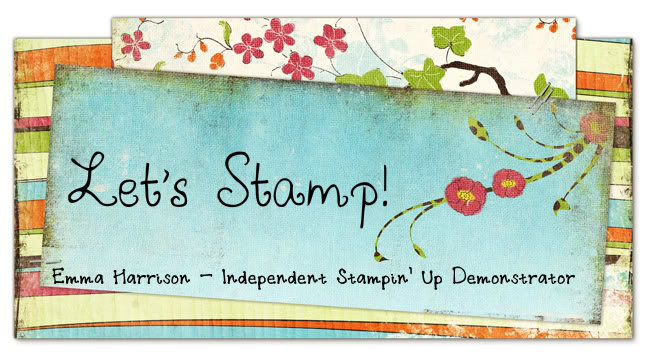 I've used one of my all time favourite Stampin' Up! colours, Cherry Cobbler. This colour along with Old Olive and Chocolate Chip is one I turn to time and time again. This time I've paired it with Basic Black and Very Vanilla for a bit of old fashioned elegance. I've stamped the gorgeous En Francais in Chocolate Chip on to Very Vanilla. I've then stamped the lovely scroll in black on to some of the Stampin' Up! white vellum paper and sewn the two together. I've also distressed the edges using oen of the metal files from the distressing kit. It's mounted on to some Cherry Cobbler which has been punched with the scallop trim border, and again distressed using a metal file. The ribbon is some of the gorgeous Red Riding Hodd ribbon that was available as part of last year's Christmas Cracker offer. I've added a couple of flowers on dimensionals decorated with some basic pearls, and of course the lovely butterfly. I was really pleased with how this butterfly turned out. I've stamped it once on Very Vanilla, and then again on the vellum paper using some crystal effects to attach it to the first butterfly. Anyway, I hope you like it and come back soon to see some more birthday cards made with this lovely set. Absolutely stunning! Love what you've done with the bliss set for this card. I just adore your card. Really curious about how you have created the scrunch look with the ribbon, I have tried so many times and failed. I will keep practicing. Thank you both. I was pleased with how this card turned out. Tracey, for the ribbon I just sewed a very loose running stich down the middle with my sewing machine. Then when finished, you just hold one end and pull the other. You can also do it by finding a thread in the middle of the ribbon and pulling it, but that's rather fiddly. Wow Emma! I just found your blog on ILWS and I'm amazed at the stuff you have on here. You are very talented!! I hope you don't mind if I start CASEing some of your stuff? I need inspiration!! 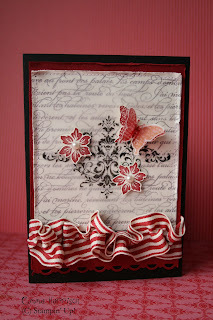 just love this card, thanks so much for the inspiration!!! !